Karkala, July 30, 2016: A media release from Rev. Dr Lawrence C. D’Souza, Convener, Committee for Dedication of this great historic shrine details the solemn event of proclamation and dedication naming it a "Minor Basilica" on August 1, 2016. The Shrine of St Lawrence Church at Attur-Karkala, in the diocese of Udupi, is a shrine reputed for blessings and favours to all devotees, irrespective of caste and creed. His Holiness Pope Francis has elevated this shrine as a ‘Minor Basilica’ through a decree on April 26, 2016. With this unique and singular privilege, Udupi in the coastal Karnataka gains a new importance. Among the churches of a diocese, a cathedral, leads the church as the seat of the Bishop. The process of naming a ‘Minor Basilica’ could last from a few months to a few years. 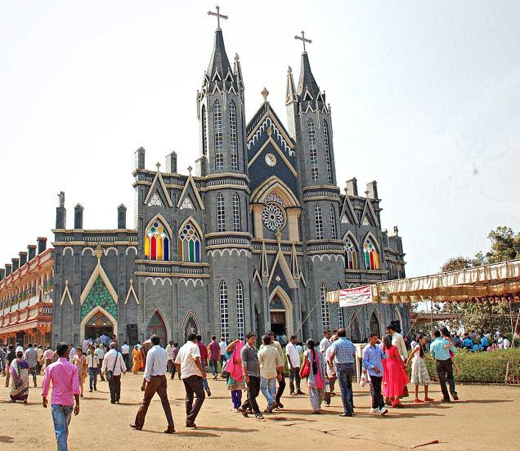 In the case of Attur-Karkala, the title has been conferred within one and a half month from the day the definite proposal was sent to Vatican through the Apostolic Nuncio Most Rev Salvatore Pennacchio. This is an indicator which amply proves, that the name and fame of the Shrine has spread wide. Functions of a Minor Basilica : 1. A minor basilica needs the liturgical instruction of the faithful is to be promoted by establishing groups concerned with liturgical activity, by special courses of instruction. and by other programs of this kind. Among the special activities of a basilica, especially mentioned is the study and popularization of documents of instruction coming from the Pope, Supreme Pontiff and the Holy See, especially those pertaining to the sacred liturgy. 2. The celebrations of the liturgical year are to be prepared and carried out with great care, especially the seasons of Advent, Christmas, Lent, and Easter. During Lent, in places that preserve the traditional form of gathering the local Church in the manner of the Roman “stations,” it is highly recommended that a basilica be chosen for celebrating this. The word of God is to be diligently proclaimed either in homilies or in special sermons. The active participation of the faithful is to be promoted both in the Eucharistic celebration and in the celebration of the Liturgy of the Hours, especially at Morning and Evening Prayer. In addition, approved forms of devotion are to be suitably fostered. 3. Since the celebration of the liturgy takes on a more noble form when it is carried out in song, care must be taken that gatherings of the Christian faithful be associated with the singing of the various parts of the Mass. Peter, every year there must be celebrated with particular care: the Feast of the Chair of Saint Peter the Apostle (February 22); the Solemnity of Saints Peter and Paul, Apostles (June 29); the anniversary of the Supreme Pontiff. Additionally : The papal symbol, that is, ‘crossed keys,’ may be exhibited on banners, on furnishings, and on the seal of the basilica. The rector of the basilica or the person in charge of it may wear in the exercise of his office — over the cassock or the religious habit and the surplice - a black mozetta with red piping, buttons, and button holes. On August 1, 2016 Monday, at 10 a.m. This historic event is set to commence. Officially the Shrine will be declared as a sanctuary of blessings, favours, reconciliation, peace, and communal harmony. Four Cardinals of India, many Archbishops, Bishops, Priests, religious and people from the dioceses of Udupi, Mangalore and neighboring dioceses will participate in this mega event. The Holy Eucharist begins at 10.00 am. The Public Function, is scheduled to begin at 11.45, Pramod Madhvaraj, Minister for Fisheries, Sports &amp; Youth Empowerment and Udupi district in-charge, Ramanatha Rai, Minister for Forests, Environment and Ecology, Sunil Kumar, MLA- Karkala, Shobha Karandlaje, MP, Oscar Fernandes, MP, Vinaya Kumar Sorake, MLA-Kaup, J R Lobo, MLA-Mangaluru South, Ivan D’Souza, MLC and Gopal Bhandary, ex-MLA will participate. The Public Function will be followed by Lunch for all. Around 10-12 thousand people are expected to participate. May the almighty shower blessings on all. There may be a huge crowd gathered in August. Atthur Church is very beautiful and is known for Historical importance. Large number of devotees irrespective of caste and creed gather . seek blessings of the Lord.